Notes on Stained Glass: Three Stained Glass windows in the church were provided by Rev Edward Bonus, in the 1880s. The Nave is undoubtedly the earliest part of the church, but with no firm dating evidence, we can only assume that the walls date from the 13th Century, as Hulcott is recorded as having a Rector before 1270. At that time, there would have been a simple Nave and Chancel, the Chancel was probably smaller than the current one. Around 1330, a S Transept or Lady Chapel was added to the E end of the Nave, by cutting an arch through the existing S wall. It would not have been a large space, but the only part of that work now surviving is the arch itself, and probably the re-set Piscina, now in the S Aisle. Soon afterwards, around 1340, the Chancel Arch and Chancel were rebuilt, probably making them larger. There are two very good original features remaining in the S wall of the Chancel, a window and a Piscina next to it. However the Chancel unusually maintains all its original window openings. The origins of the E window are from the 14th century, but the Tracery is from around 1420. The W and N windows of the Nave date from the 15th Century, the N one being unusually large for a N wall. They were replacedto enlarge them, as was often the case. The adjacent Porch could date from the same time, but is probably later. The wooden bell turret could also date from the 15th Century. It is over the W end of the Nave, on a wooden framework supported by four timber posts that reach down to the floor of the Nave. Such timber structures can be difficult to date. It was not until the early 16th Century that the Transept walls were demolished to enlarge the church by adding a new S Aisle, the complete length of the Nave. A new arch was cut from the Nave wall, kept seperate from the Transept arch, that had been cut from the same wall 200 years earlier. However at the West end of the wall, a window of the 14th and 15th Centuries is still in place, which originally lit the Nave. It is now between the W ends of the Nave and S Aisle, behind the organ in the Nave, and in the Vestry in the S Aisle. All these sort of changes and ambitious projects in a church's development can often be tied to a new Lord of the Manor in a parish, especially when they held the Advowson for a parish, entitling them to appoint the Clergy and be Patron to the church. In particular, a new family might well want to create an impression, and there would be no finer way than making a significant addition to a parish church. Some of the additions and changes to Hulcott church appear to tie in very well with changes in the family names of the Lords of the Manor of Hulcott, with their Manor House that stood just to the S of the church, or previously within a moat just to the E of the church. There is really only evidence of one Lord of the Manor within the church. The S Aisle was added during the time Benedict Lee was Lord of the Manor, from 1472 to 1535. In the S Aisle there is an altar tomb which originally had brasses whose heraldry showed the tomb remembered a member of the Lee family. The Lord of the Manor again played a vital role in the church's history in Victorian times. The Rothschild family were buying large tracts of land in mid Buckinghamshire, and around 1859 Lionel Rothschild became Lord of the Manor of Hulcott. The era saw two new schools, new houses around the village green, and improvements to other properties, including an ornate brick wall along the front of the churchyard. Most of these works in Hulcott were the first of many Rothschild family projects commissioned from the architect George Devey, that were built across mid Buckinghamshire. There was a succession of three Rectors during this important era for Hulcott church. Between 1861 and 1863, the Oxford Diocesan Architect George Edmund Street was called in to restore All Saints Church. All the roofs were replaced with Street's typically solid structures, and the sturdy stone pulpit is unmistakeably Street's work. As in many other churches Box Pews were replaced with ordinary shorter ones. In 1864 the Rev Edward Bonus was appointed Rector of Hulcott, and he enhanced the church with three stained glass windows, and other items including the very elaborate altar. He was also Rector of Buckland church where he carried out similar work, spending much of his own money on ambitious projects to his taste, although sometimes regardless of other people's wishes. Hulcott has always been a small community, with its population never having been more than 150 people. Unfortunately, in 2018, the future of the church is looking uncertain, with the Parochial Church Council concerned about the costs of maintaining the church, and a lack of enough volunteers willing to take on the essential responsibilities of running All Saints Church. When visiting a church, many people will choose to look around the outside first. It will usually show you the overall layout of the church, and could show you whether it was built in one operation, or has developed over many centuries. It can also indicate whether the church has had large scale restoration work, which might not be so visible inside. So firstly, a look around the exterior of All Saints Church. This is the N side of the church, with the Chancel on the left. The higher Nave is on the right, which is the oldest part of the church, the walls being built in the 13th Century. The bell turret was added later, although originally there could well have been a simpler structure for a single bell. All the exterior of the Bell Turret is fairly modern, especially the wooden shingles, which always attract the attention of woodpeckers. The N side of the Nave has a very large window in the Perpendicular style, so must have replaced a much smaller window in the 15th Century. The Porch could have been added at the same time, or a little later, even into the 16th Century. The outer arch of the Porch is very sturdy and simple, the only ornament being a plain chamfer. On the W wall of the Porch, the small window is also a simple structure, of four stones. The Doorway inside the Porch is 14th Century, and although usually regarded as fairly plain, has finer decoration than the later Porch itself. This is the Chancel from the N, we can see that two large brick buttresses have been added on the east wall to support the Chancel. There are only 2 small openings in this N wall, a door and a small window. Such windows are usually called low side windows, and are always just to the E of the Chancel Arch. This one could be original to the Chancel of c1340. The Tudor style Priest's Doorway dates from the 16th Century. Over the Priest's Door is a label or drip-moulding with a stop at each end, which are carved as heads. Most writers about the church claim that they are monkey heads. Below we are now looking at the East end of All Saints church (on the right), and looking down the S side (on the left). Immediately we see that there is a large S Aisle alongside the Nave, and we can see that with one flat wall at the end of them both, we know their E ends are in line with each other. In between the brick buttresses is the E window which looks fairly small for an E window, but a close look reveals that the window has never been enlarged as we are still looking at the original wall opening from c1330. At the sides of the window, the jambs are original features from the rebuilding of the Chancel about 1340, which is at the very middle of the Gothic Decorated Style period. Each side there is a head at the top of the shaft, but the right hand one is very worn. Having heads as tiny capitals on the shaft of a window jamb like this is very unusual, particularly for a small rural church. A closer look at the head on the left hand shaft. Inside the window has a wider arch, also with shafts and head capitals. This is the S window on the side of the Chancel. Again we find some original stonework from c1340, including much of the attractive tracery itself at the top of the window. This is the W end of All Saints church, which is the view on entering the churchyard. The Nave is on the left, with the S Aisle on the right. We can now clearly see that the Nave and Aisle are of equal widths. From the SW, we see that the the large early 16th Centeury S Aisle has Perpendicular style windows similar to the large one on the N side of the Nave, so we can imagine that was fitted at the same time as the S Aisle was built. In the 1860s, an unusual and decorative red brick wall was built along the front of the churchyard, which faces the village green. The wall and lychgate were probably designed by George Devey. The wall stood on a brick plinth, with gabled piers each having a trefoil headed panel and tiled copings. Between the piers were bays of open balustraded walling, with each opening having a trefoiled head formed from two specially shaped bricks. 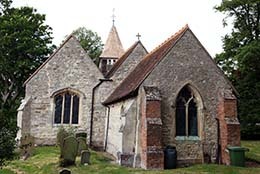 The bays were topped by tiled copings, there was one bay to the left of the Lychgate, and nine to the right of it. The wall stood for 120 years, but was badly damaged by the 'Great Storm' of 1987. Despite some initiatives to try and rebuild it, because of further deterioration, the long 9 bay section has now had to be dismantled. Now only one bay of the wall survives, together with the Lychgate. Wall shown on a postcard of the late 1920s. The only bay of the wall that now remains, to the left of the lychgate. Part of the longer section of the wall that remained in 2012. A closer look at the section remaining in 2012. Some more of the wall collapsing, in 2012. The remains of most of the wall at the back of the churchyard, in 2016. The plinth of what was the long 9 bay section of the wall, in 2016.